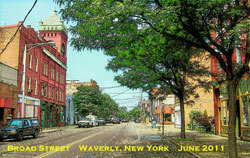 Waverly NY welcomes you to come and discover all that we have to offer, from visting a museum that is preserving the area’s Native American history to a walk or drive down Chemung Street and Park and Pennsylvania Avenues for a look at the several homes with elaborate architectural stature and historic worth, and or for a taste of delectable food from one of our home town restaurants/diners, shopping in our unique stores to spending a night or more in a lovely Victorian bed and breakfast. Conveniently located next to Interstate 86 between Binghamton and Elmira, with easy access at exits 60 & 61. Routes 17C, 34 & 220 intersect at Waverly NY on Chemung Street.